North Carolina’s controversial method of grading its schools—which includes dishing out “D” or “F” grades to designated “low-performing schools”—failed to find a single defender at a forum of educators, lobbyists and activists Monday night in Raleigh. The meeting, led by the Public School Forum of N.C., a research and policy group in Raleigh, centered on identification of low-performing schools, a system that hinges heavily on test scores. Most who spoke Monday said the formula should focus more on student growth in test scores, so as not to unfairly penalize schools with a challenging student body. 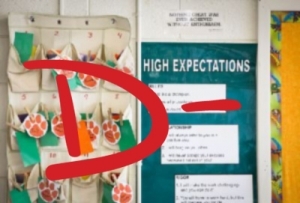 Currently, 80 percent of a school’s performance grade is determined by test scores. The remaining 20 percent keys upon students’ academic growth. Many who spoke Monday suggested reversing that ratio, or favored a 50-50 split between test scores and growth. Research has shown that socioeconomic status is one of the greatest predictors of academic performance. And with many schools in North Carolina overseeing a student body comprised largely of students receiving free or reduced lunch, advocates say student growth is a greater measure of a school’s performance than its testing scores. “The negativity that comes with that low-performing status pushes back on us,” added Rusty Hall, one of several award-winning principals at low-performing schools who spoke on Monday’s panel. Hall is the principal at Old Town Elementary in Winston-Salem, a school with 100 percent of its students receiving free or reduced lunch. Hall, like several educators who spoke Monday, said the “low-performing” designation makes teacher recruiting extremely difficult, adding that better teacher pay is just one of many ideas for improving the environment for such teachers. Monday’s panel also included Carrie Tulbert of Concord Middle School in Cabarrus County, Kristy Thomas of Rock Rest Elementary in Union County and Jacqueline Williams of Pittman Elementary in Halifax County. The panel was moderated by Rep. Graig Meyer, a Democrat from Orange County and outspoken schools supporter in the legislature. Monday’s forum was originally scheduled to include a discussion of N.C. Rep. Rob Bryan’s controversial proposal for achievement school districts, legislation that could hand over control of chronically low-performing schools to for-profit charter operators. But with lawmakers expecting a new draft of Bryan’s achievement school district legislation as soon as next week, organizers opted to hold off on the discussion. Meanwhile, Tulbert said Monday that legislators in Raleigh need to show some patience. It takes time and resources to turn around low-performing schools, she said. “When your kids come to you and can’t multiply regular numbers, they’re going to have a hard time multiplying fractions,” said Tulbert. Williams said “human capital” may be one of the most important factors in creating change at a school. “It’s not fair for a teacher to have 29 fourth-graders,” said Williams. Thomas advocated for greater flexibility in low-performing schools, arguing that educators should be given leverage to “take some risks” when dealing with students who have struggled to respond in classrooms. “At the end of the day, all our kids care about is that there’s a teacher in the classroom and that teacher cares about them,” said Thomas. It would be great to create a panel along these lines that shows how the struggles and transformations in North Carolina’s K-12 classrooms are now quite similar to the struggles and transformations facing NC public higher education. Funny that the ones now being graded, hate being graded and having some accountability. Hypocrisy, thy name is Pubic Education Administrator!